Members of Nepal's cabinet wearing oxygen masks at their Everest Declaration Climate Change meeting over 5000m on Kala Pathar. Photo CNN. Early in December in the lead up to the Copenhagen Climate Conference Nepal came up with a 10-point declaration for dealing with the environmental impact on Everest and the Himalayan region caused by global warming. A few years ago Peter Hillary warned that some areas around Everest are sinking, with Base camp, (used by his father Sir Edmund Hillary and Tenzing Norgay) having shed about 40 meters of ice. 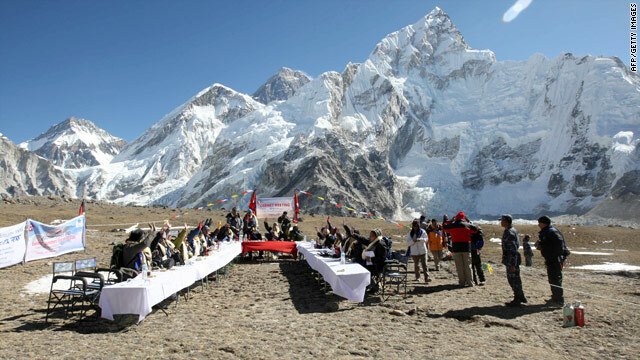 The Everest Declaration was issued following the Nepalese cabinet ministers’ historic session held at the Kala Patthar base camp at over 5000m high. Full points to the ministers for going there and coming up with the Declaration. I was at Kala Patthar myself some years ago and found it hard to breathe let alone think 😉 I guess it helped that they had oxygen masks. Effects of global warming are causing increasing natural calamities, impacting wildlife as well as putting pressure on the nation’s socio-economic development. The 10-point declaration includes strategies to raise national awareness on global warming and a government commitment to increase conservation areas in Nepal from 20 percent to 25 percent and consolidating 40 percent of forest area. We’ll watch and see how this progresses over the next year few years.